The third installment of Sony's premier FPS franchise is on its way, and it will be popping out at you from the TV. 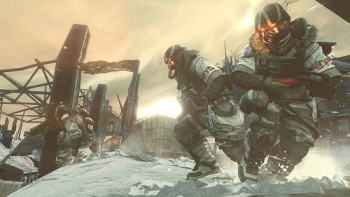 Back in March, it was rumored that Sony was bringing Killzone 3 to bear with Gears 3 in its sights, and then Sony's Jack Tretton explicitly promised that the title would come. At an event in Amsterdam, journalists were shown the first glimpses of Guerrilla's upcoming shooter - and it was revealed that the game would support (optional) 3D functionality. According to Sony, Killzone 3 picks up right where Killzone 2 left off, and is a "a much grander experience in terms of scale and ambition." There will be more close-range attacks called Brutal Melee attacks, there will be more varied and "massive" environments and a broader look at the planet Helghan instead of the "Hey guys, this is the Space Nazi world" treatment we saw in Killzone 2. Will show the Helghast have humanity left in them. - Will have the feeling that "of being in a place far away from home, outnumbered by people who want to kill you." - Will be like Inglorious Basterds. - All of the characters in the screenshots are flying in.. jetpacks?! - Will include arctic levels. - Have to wear 3D glasses, apparently the 3D effects are "crazy." - Combat is "unchanged from predecessor." - Or is it? Hand to hand combat involves you "Unloading a string of different (and often brutal) attacks on stunned enemies." - The scale is supposed to be "bigger this time." - The Jetpacks are "surprisingly lightweight and agile, Killzone 3's jetpack is easier to maneuver compared to the sluggish incarnations of the gadget found in other games." - New weapon called the Wasp, basically shoots a "flurry of rockets" at an enemy. - Will show off the Helghast culture. - There is actually a Helghast language, which will be explored in the game. - Jetpacks double as a weapon, which basically means a machine gun mounted right on top of it. - If you shoot Helghast with jetpacks, they'll "explode like roman candles"
- To control the jetpack, you "have to activate bursts of speed in midair, propelling yourself across further distances." Oh man, did you hear that? Screw 3D - this game will have jetpacks!